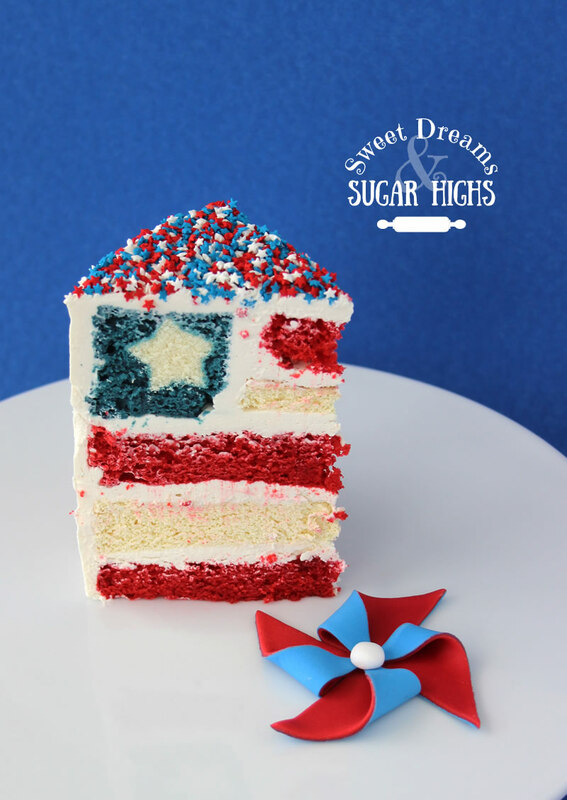 The 4th of July has come and gone but I wanted to share with you the patriotic dessert I made for our Independence Day cook-out last week. 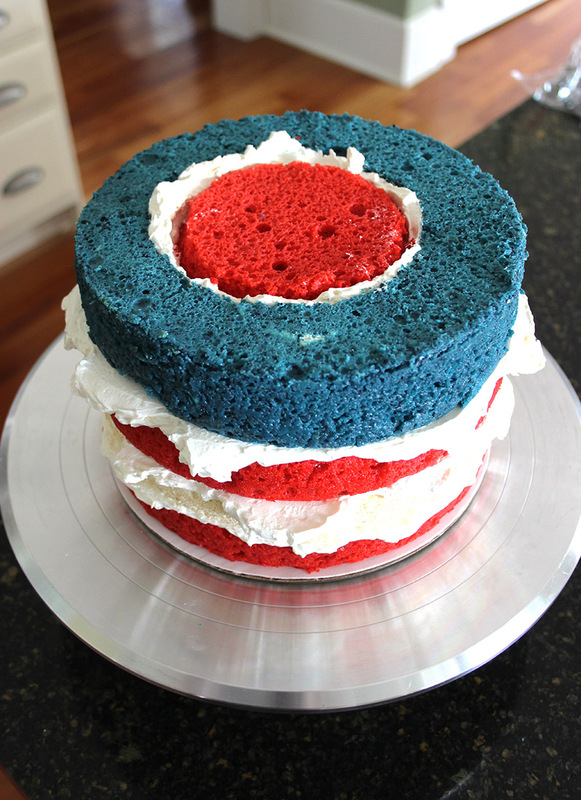 I had been wanting to make a flag cake for the last couple of years but I always forgot about it until after the 4th was over. Well, I was on the ball this year and remembered ahead of time. 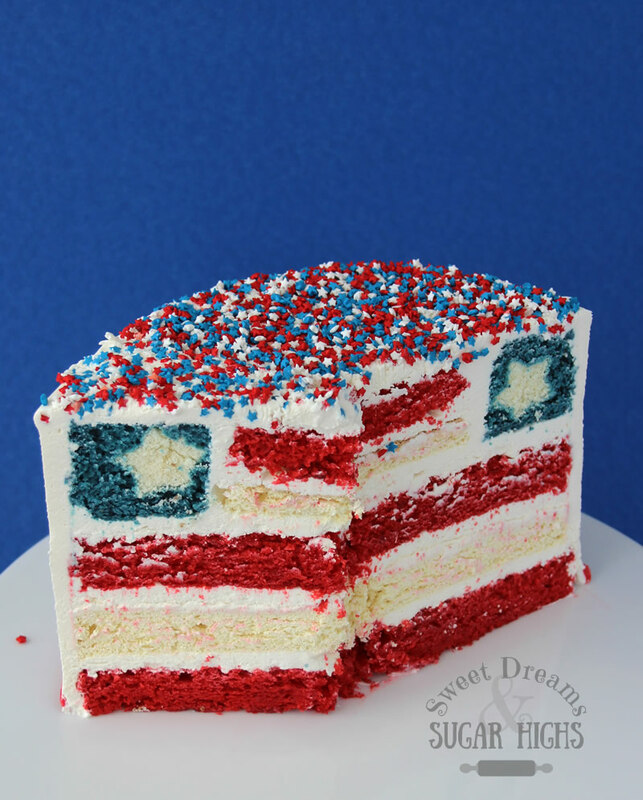 I have seen several versions of these flag cakes floating around the internet but they are usually just solid blue in the upper corner of the flag. 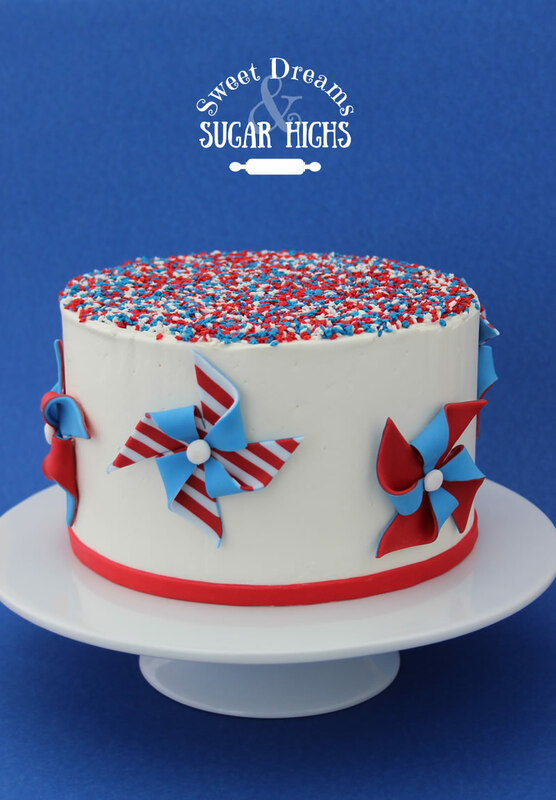 Then I found this cake by Sugarhero.com and I loved how she put a star in the middle of the blue section. She used cookies for her star but I wanted mine to be all cake so I used her technique but replaced the star cookies with pound cake. Keep reading for a full tutorial on how to do it. 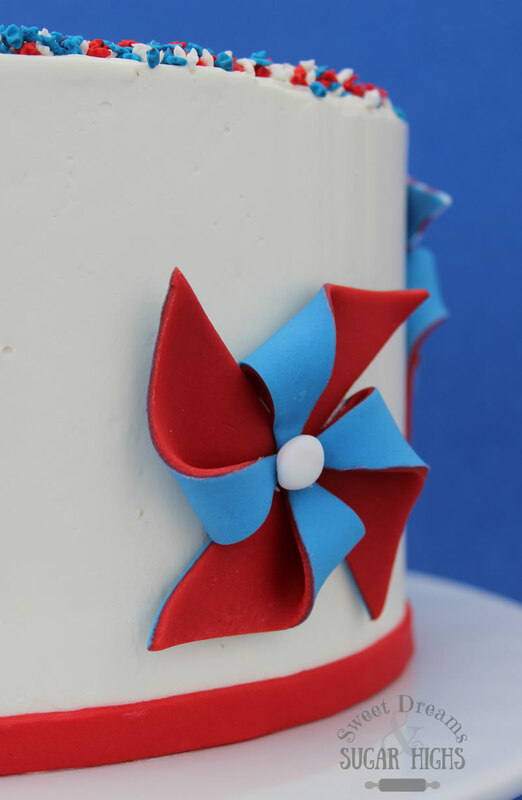 I also wanted something fun and patriotic on the outside of the cake so I thought pinwheels would be a cute way to keep with the theme but not take away from the inside surprise that comes once you cut into the cake. 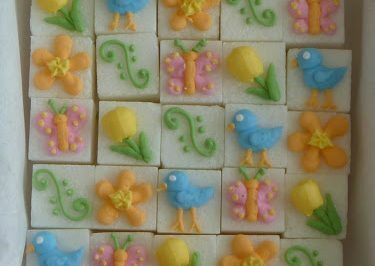 I found this wonderful fondant pinwheel tutorial from The Cake Blog and used it to make 6 adorable pinwheels to surround my cake. 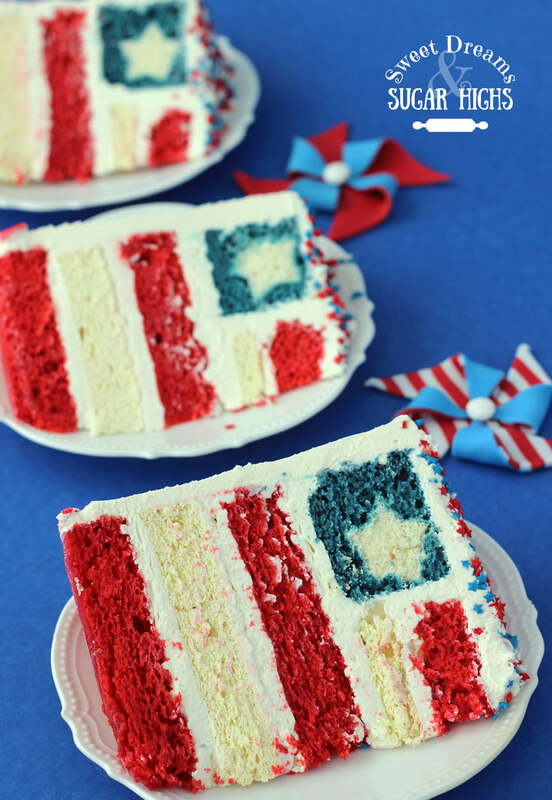 Of course the real excitement comes when you cut into the cake and find an American flag inside. I would have liked to get a better photo of the cake with only a small portion cut out but we were all hungry and I didn’t get a chance to take a decent photo until we had already served most of the cake. The other great thing about this cake was that it tasted wonderful!! I bake from scratch most of the time but now and then I like to use a doctored cake mix. That just means that I use a cake mix as the base of my recipe then add in other stuff to “doctor” it up a bit. That is what I did for this cake. 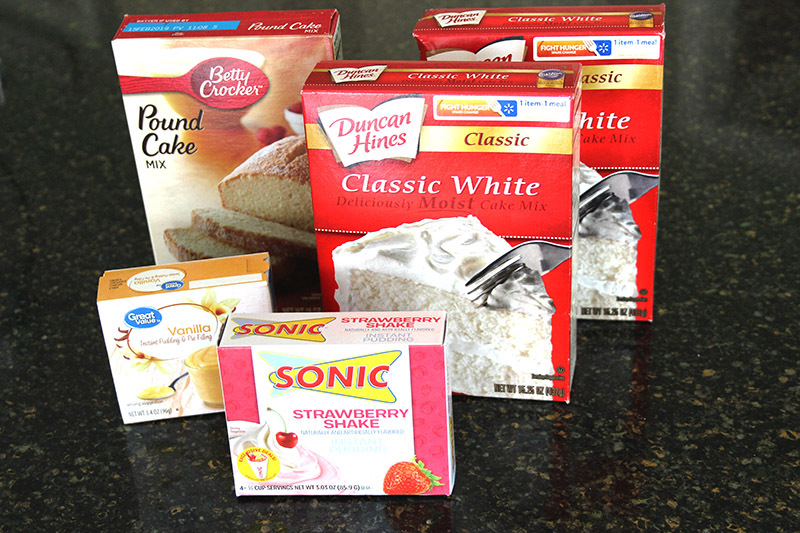 Below are the cake mixes and pudding mixes I used in this cake. If you scroll down to the full recipe you will see that I also added sour cream to all the cakes, as well as pureed strawberries in the red cakes and pureed blueberries in the blue cake. The addition of fruit, along with the pudding mixes and richness of sour cream really punched up the flavor in these cakes and made them very moist. The icing was also really yummy. I used Elizabeth Marek’s Easy Buttercream Frosting recipe for the first time and I loved it. It is basically a Swiss Meringue Buttercream without the hassle of having heat the egg whites. This is likely going to become one of my go-to icing recipes from now on. 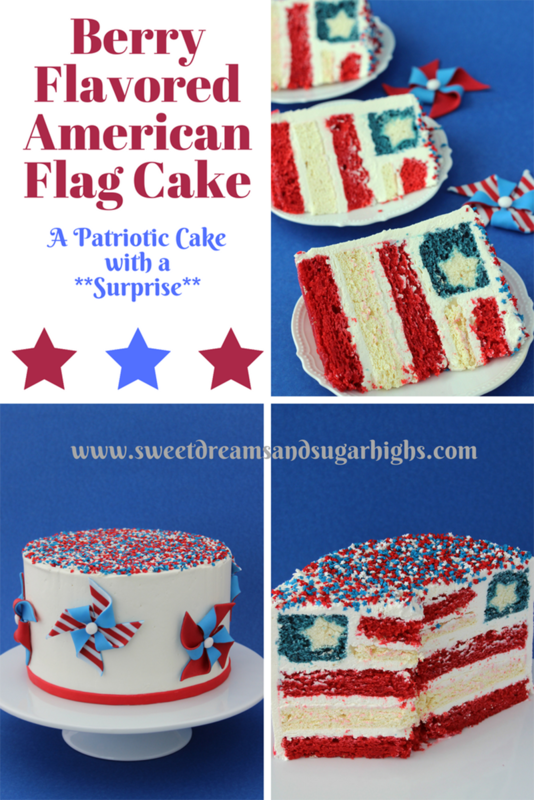 To create the flag cake, I started off by making lots of little stars out of pound cake. I wanted this cake to be very firm so I made it using the Pound Cake mix as-is, only adding the ingredients given in the instructions. I made it in a loaf pan then, after it had cooled completely, cut the loaf into 1/2″ slices and used a mini star cutter to cut out lots of star pieces. I then set those aside and started on my doctored cake mix recipes. I used a full Classic White Cake mix and box of Sonic Strawberry Shake Pudding mix to make two 8″ round red cakes. Then I divided the next cake mix in half, along with the Vanilla Pudding mix. 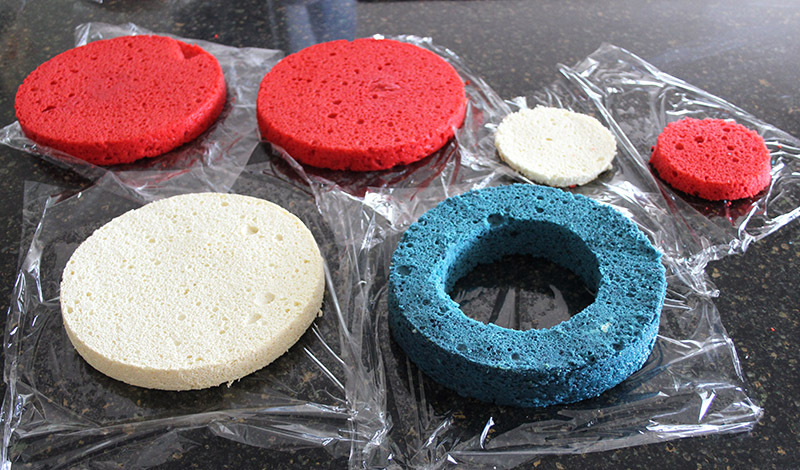 I used half of it to make one 8″ round white cake and the other half to make the blue cake ring. I sometimes like to use Bake-Even strips wrapped around my pan to help the cake rise evenly. As you can see, this is the white cake batter before going into the oven. 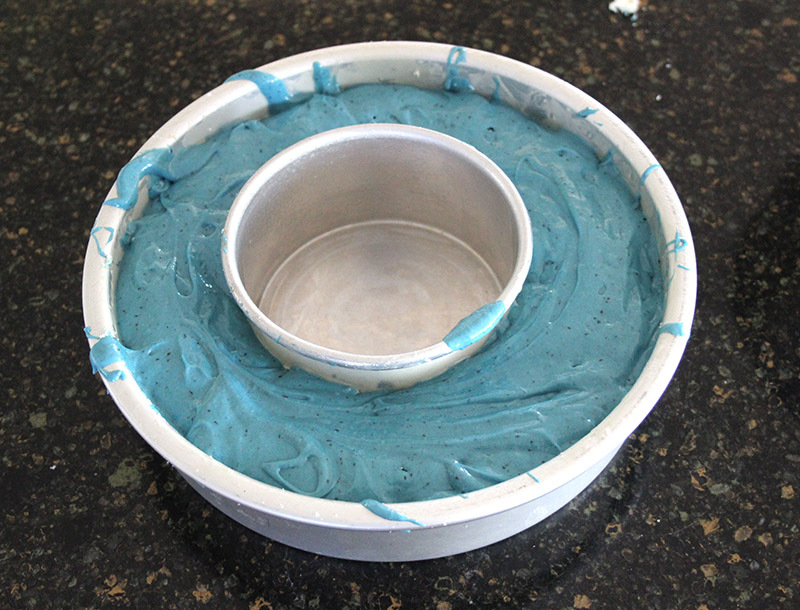 For the blue cake, I made a ring out of my 8″ cake pan by placing a 4″ cake pan in the center of it then spreading enough cake batter to cover the bottom of the ring. Pulling out those pound cake stars I had set aside, I lined them up until they fit snuggly around the center of the ring. It took about 40 starts to fill the pan. I then covered all the stars with the remaining blue batter and baked it. Do you notice how much taller the 4″ pan is now than when I put it in the oven? Since there was no weight in the 4″ pan, the blue batter spread under the pan and lifted it up while it baked. It actually ended up being a good mistake because the batter never overflowed in the oven and I was able to easily cut out the center of the cake since it was so well marked. Luckily the stars all stayed in place while they baked so it didn’t affect them either. After all the cakes had cooled completely, I torted the red and white cakes so that each individual cake made two 1″ layers. 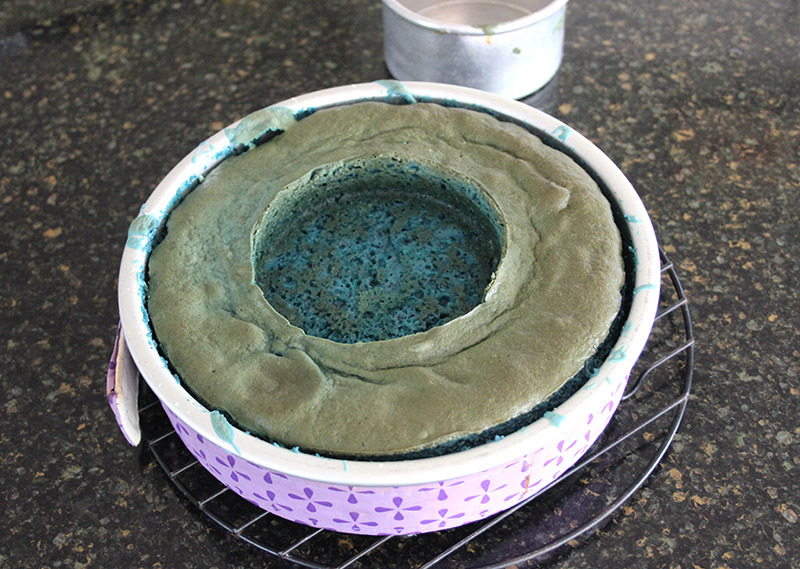 The blue cake I did not torte, just cut out the center and trimmed the top so that it was 2″ tall. 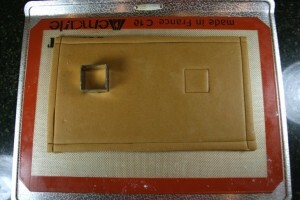 On one of each of the red and white layers I used the 4″ pan as my guide and cut out the center of each layer. 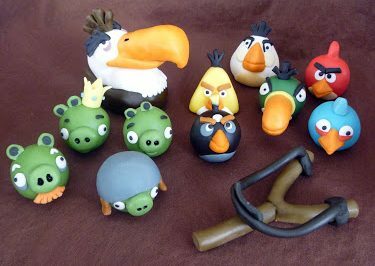 Here are the final pieces of cake that I used, after cutting everything. There was an additional full layer of red cake and the outer rings of the small red and white cakes that I didn’t need so I set them aside and somehow they disappeared after my husband visited the kitchen while I was out of the room. 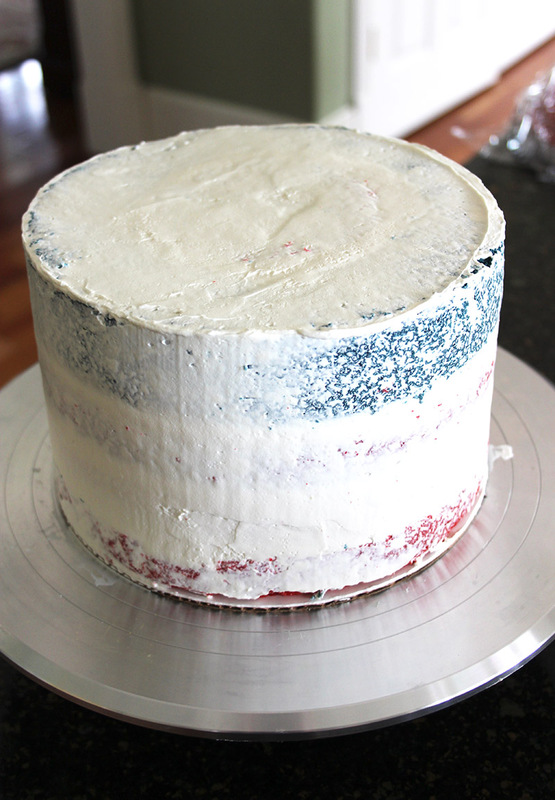 To assemble the flag I started with a red layer, covered it in icing, then added a white layer, covered it in icing, then another red layer, covered it in icing, and then topped that with the blue ring. I iced the inside of the blue ring then inserted the small white layer, covered it in icing, and finished with the final small red layer. The next step was to crumb coat the whole cake and then allow it to firm up in the refrigerator for about 30 minutes. I then did my final coat of icing and smoothed it out nicely. I wasn’t too worried about smoothing the top since I was going to cover it in sprinkles. 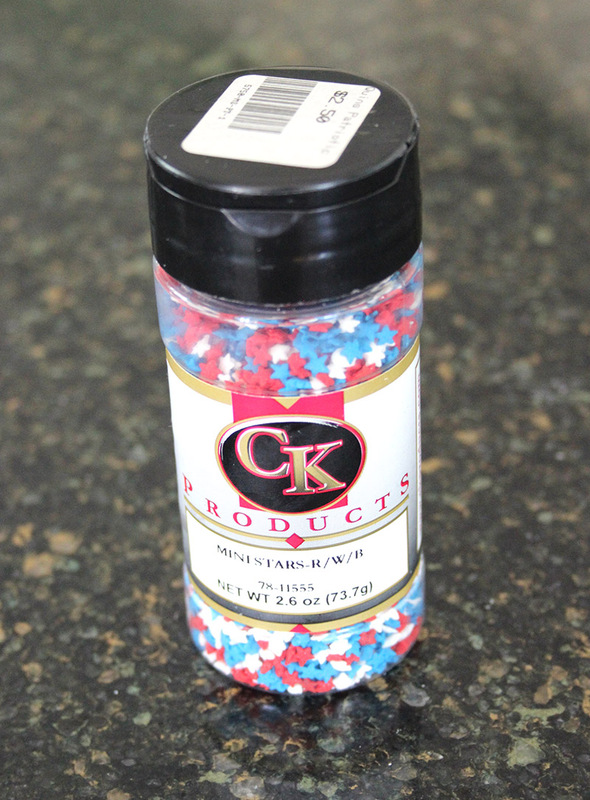 I have had these mini star sprinkles for a while so it was great to finally have the perfect project for them. 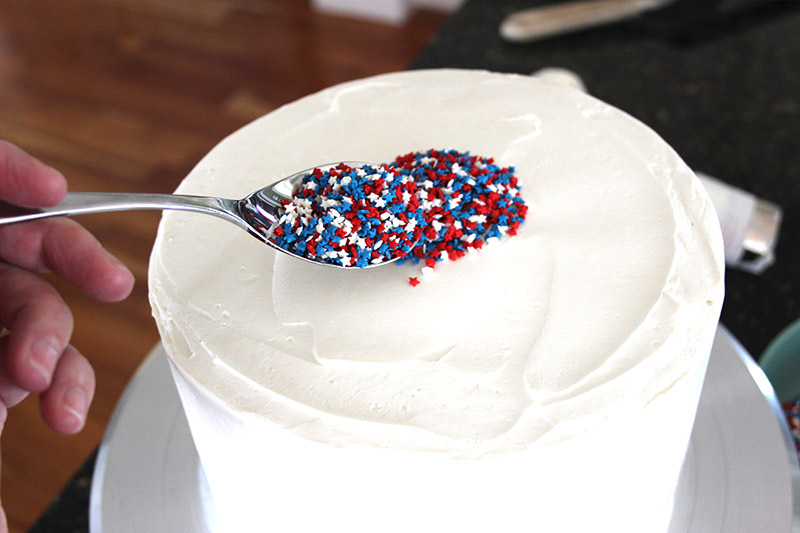 To cover the cake, I poured all the sprinkles into a bowl then carefully spooned them on top of the cake and used my hand to gently press them into the icing. You want to be careful so that you don’t pour any down the sides of the cake. I wanted to place the six pinwheels evenly around the cake so I printed out a photo of a circle divided into sixths then cut it out and laid it on top of the cake. I then used little strips of Post It Notes to mark on the plate where each of those lines meet the edge of the cake. Having the top and bottom markers made it easy to visualize where to place the pinwheels. I wanted them at differing heights around the cake so I didn’t worry about marking height lines. I ran into a problem though; as I started to attach the pinwheels with icing I discovered that they were too heavy for the icing to hold up on its own. To solve this problem, I stuck a toothpick into each pinwheel, pushing it deep into the cake so that you could barely see it sticking out of the pinwheel. See it hiding at the bottom of the center dot? If you do this, just be sure that whomever is cutting the cake knows to remove the toothpicks before serving it. And here, once again, is what the final cake looked like. 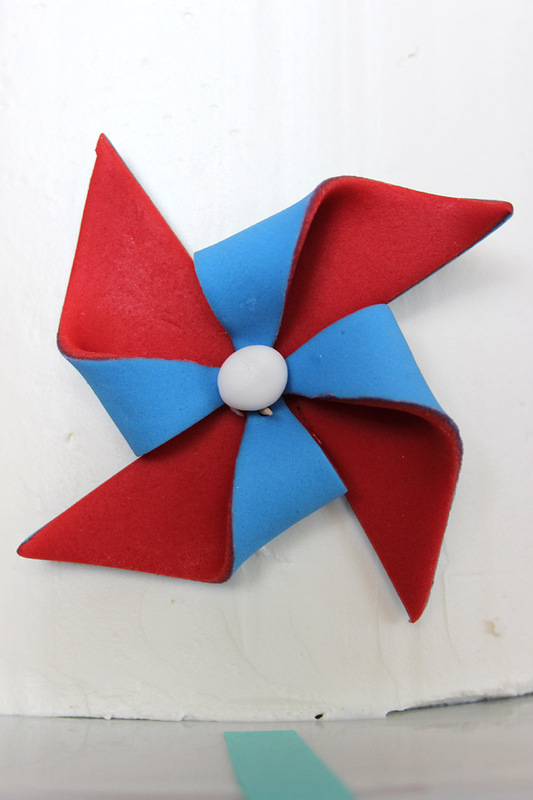 You can barely tell that there are toothpicks holding up those pinwheels. The only real nerve-wracking thing about cakes that have a surprise inside is that you have no idea if it actually worked until you cut into them. So I let out a huge sigh of relief when I cut the first piece and saw “Old Glory”, with her star and all. This was such a fun cake to make that I’m sure I will be doing it again. But next time I want to give it to someone who has no idea about the inside and then watch their reaction as they cut the first piece. I hope you all had as great of a 4th of July as I did. Once again I thank God that I am an American and live in the Land of the Free and the Home of the Brave! 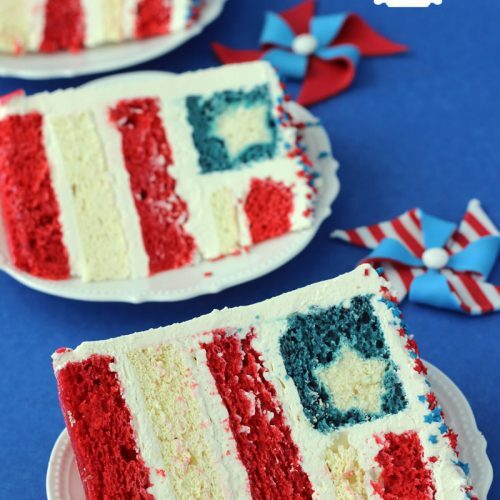 Surprise your guests by serving them a slice of American Flag cake. This cake uses cake mixes as a base for the recipe and doctors them up to create a moist, berry flavored cake. 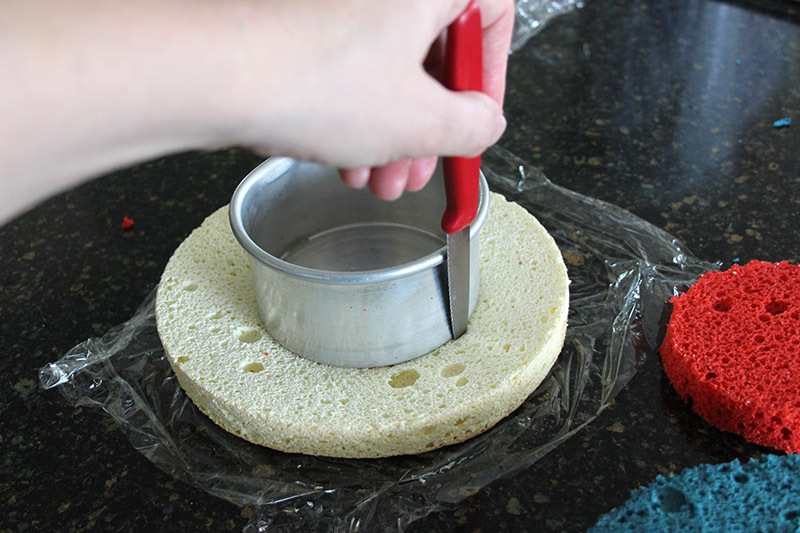 Make pound cake according to box instructions in a 9" loaf pan. 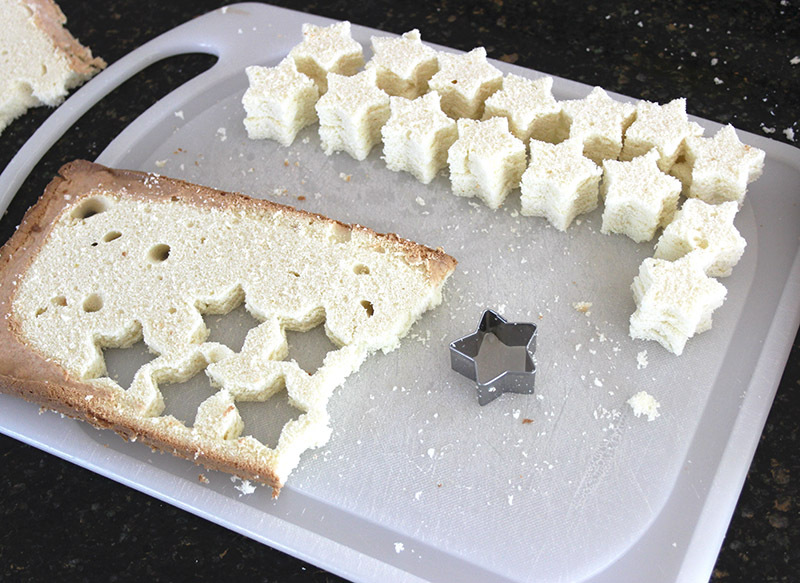 When completely cooled, cut into 1/2" slices and use a mini star cutter to cut 40 stars. Set aside. Preheat oven to 325 degrees. Grease and flour two 8" round pans, or coat with baking spray. Wrap pans in bake-even strips if desired. Combine all ingredients in a mixing bowl and mix on low speed for 30 seconds. Scrape bowl then mix on medium speed for 2 minutes. Pour into prepared pans and bake. Start checking cakes at 30 minutes for doneness. Baking time may vary; cakes are done when the top bounces back and a toothpick inserted into the middle of the cake comes out clean. Remove from oven and allow to cool on a cooling rack for 10-15 minutes. Remove from pan and allow to cool completely. Once cooled completely, level cakes and torte into 1" layers. Set one layer aside to snack on or eat later as you will only need 3 layers. 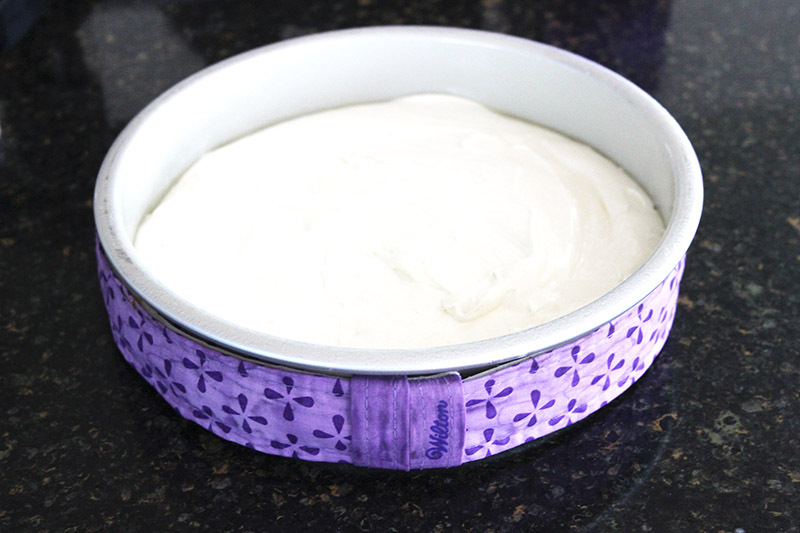 Use a 4" cake pan or circle pattern to cut the center out of one of the layers. The outer ring of this layer will not be needed. 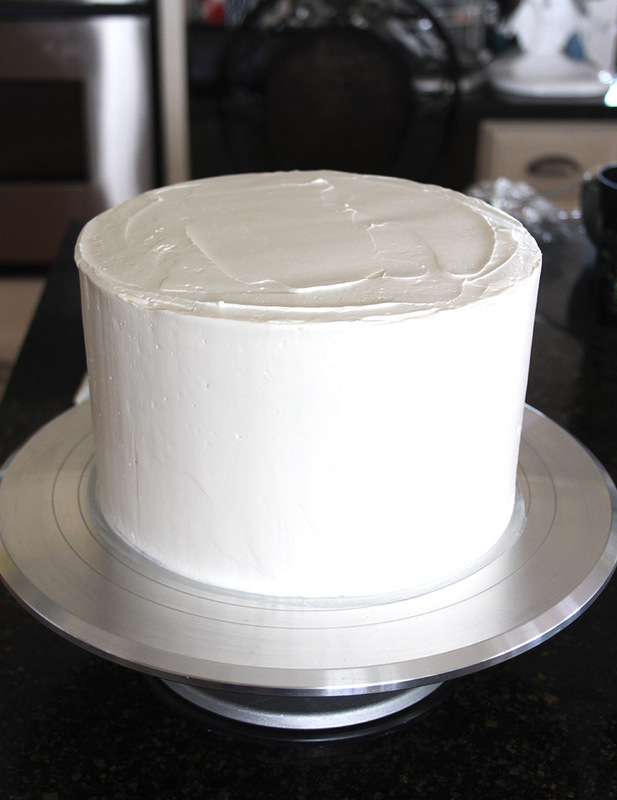 As with the red cake, level and torte the cooled white cake and cut a 4" circle out of one of the layers. You will not use the outer ring of this layer either. 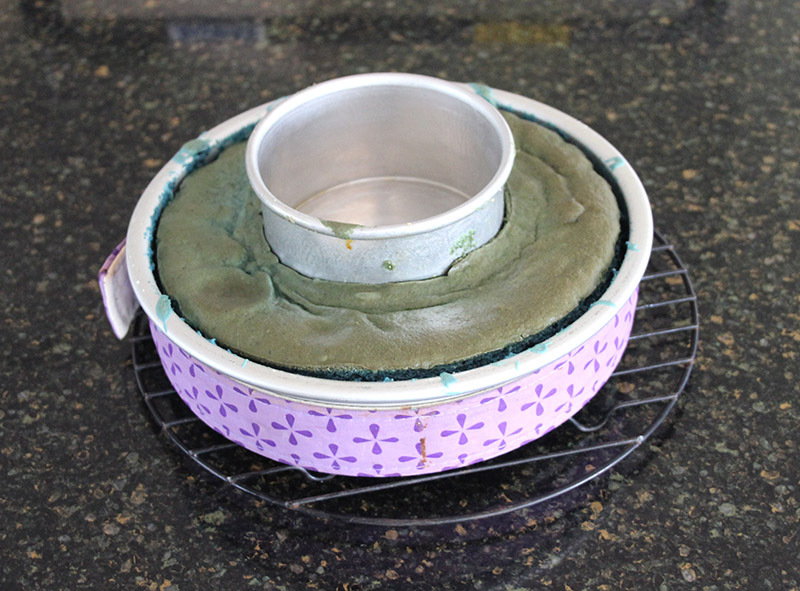 Prepare one 8" cake pan by greasing and flouring, or spraying with baking spray. Grease and flour, or spray, another 4" cake pan/cake ring and set in the center of the 8" pan. Bake at 325 degrees. Start checking for doneness at 30 minutes. When inserting toothpick, be careful not to insert into a star or you will get a false reading. When done, remove from oven and allow to cool on a cooling rack for 10-15 minutes. Remove from pan and cool completely. When completely cooled, level top of cake but DO NOT torte. 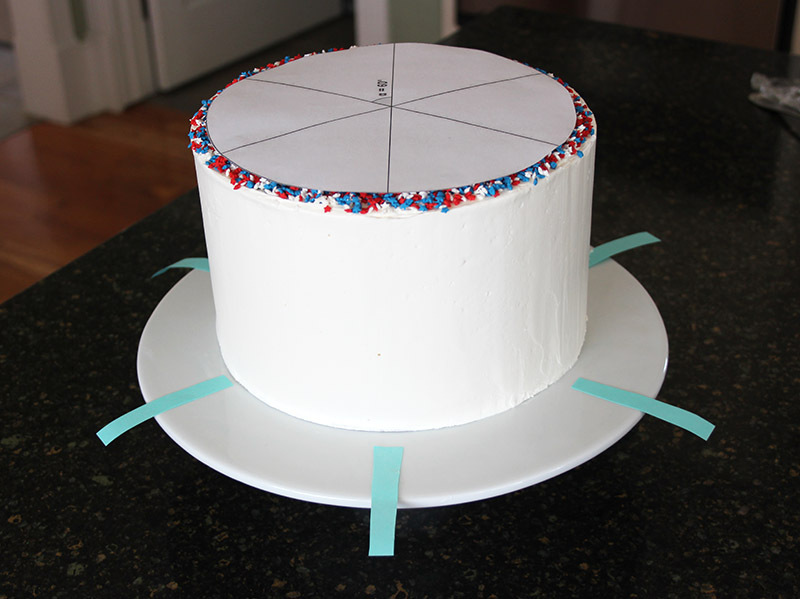 If necessary, cut out any cake that may have spread to the center so that there is a circle in the middle of the cake. Lay one red layer on serving plate and top with buttercream icing. Lay one white layer on top of that and top with more buttercream icing. Repeat with an additional red layer and more buttercream. 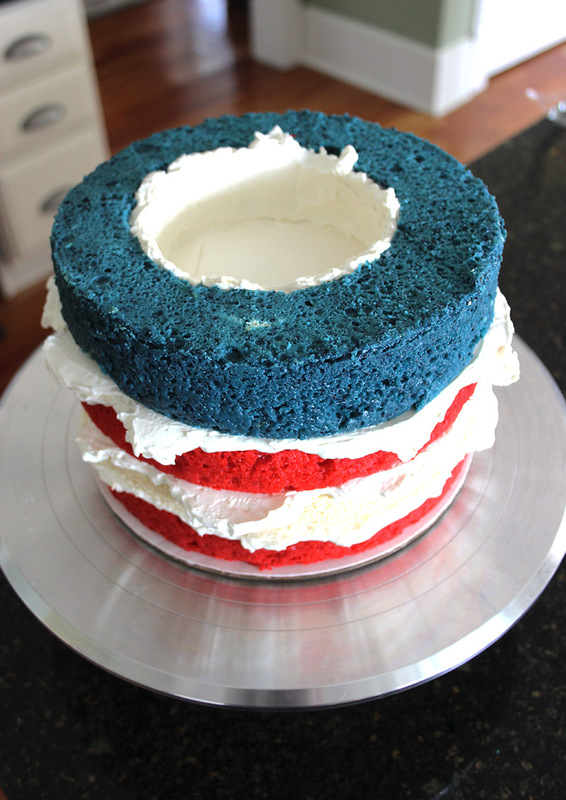 Lay blue ring cake on top of the layers. 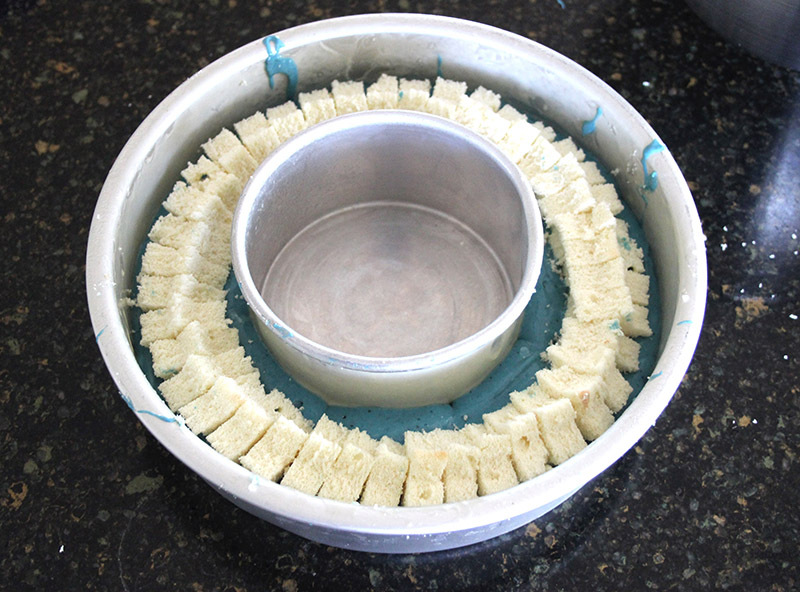 Spread buttercream along the sides on the inside of the ring. Insert the small white cake circle into the center of the ring and top with buttercream. Finish with the small red cake layer. Crumb coat the entire cake in a thin layer of icing and refrigerate for about 30 minutes to allow crumb coat to harden. Finish by icing with a final coat of buttercream. Decorate as desired. *Use your favorite buttercream frosting recipe. I used Elizabeth Marek's Easy Buttercream Frosting. That recipe can be found HERE.